Railways around Peterborough and The National Rail Network and Heritage railways in the UK. 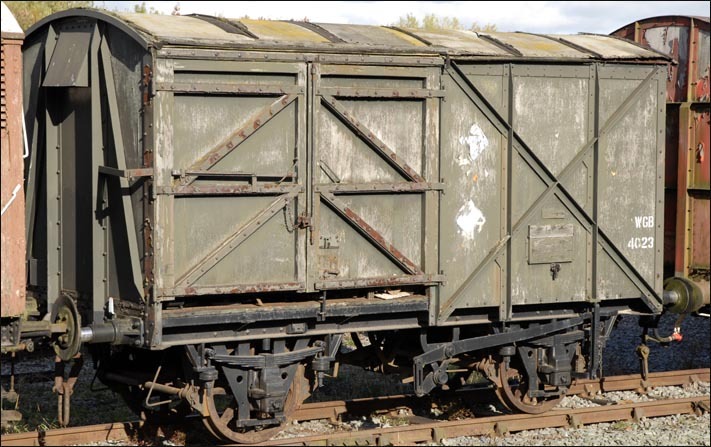 The wagons in the list below are just some of the wagons that have been saved at the Great Central Nottingham at Ruddington Fields. When the new bridge is build over the Midland Main line and this railway is joined to the main Great Central and trains start running, these wagons will then become part of The Great Central wagon fleet. This website is Ukrailways1970tilltoday.me.uk it is a webe site on railways, but it is not just on trains, but all things railways, with photos, which I have taken from the 1970s till now. I take photos of all things railways, steam diesel and electric trains, wagons like this page, any thing that is on the National Rail network, which was BR when I started taken photos. Today EWS, East Coast, Central trains and EWS are just some of the names on the trains. The name on the train does not mean, thats whos train it is these days. These names keep changing, but that means I have to keep taking photos. I also take photos of preserved railways with steam diesel and electric trains.There is lots more to add and I keep taking More!